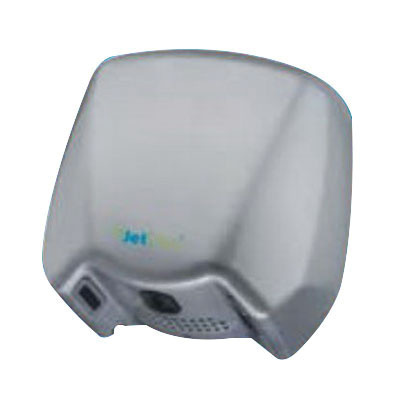 Jetdryer High-speed hand dryer in silver color, features die-cast aluminum construction and powder coated finish. It offers dry time of 10 - 15 secs. Jetdryer 3D technology helps to automatically adjust the heater depending on the ambient temperature of the air surrounding the dryer. Hand dryer has voltage rating of 110-Volt AC. It provides 3D drying experience that lets air jet from three various angles to surround your hands and dry them evenly and quickly. Hand dryer has an easy to change antibacterial filtration system that offers safe and clean delivery of air. It measures 13-Inch x 13-Inch x 8-1/16-Inch. This hand dryer comes powered with high-speed brushless motor for durability. It is perfect for use in public washrooms.